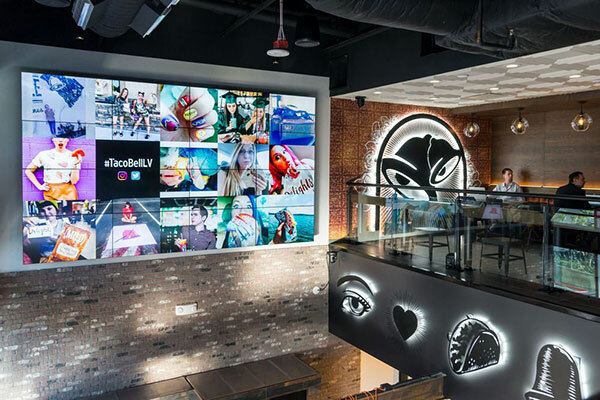 Taco Bell is expanding in a bold, innovative way with the launch of its new “Cantina” restaurant concept. The two-story flagship Cantina, located on Las Vegas’s popular Strip, features a novel combination of entertainment, expanded menu, and adult beverages. Engage, captivate and entertain patrons as they browse, order and dine using a large video wall for a fun, social dining experience. RGB Spectrum’s MediaWall® V processor drives the Cantina’s massive 14-foot by 8-foot video wall array. The MediaWall displays live-streamed broadcast, sporting, and news events, as well as social media content. MediaWall’s embedded processing architecture delivers exceptional 24/7 reliability for this high-traffic, high-visibility installation. It displays imagery in windows of any size, anywhere on the video wall canvas to enhance the entertainment experience.